Mohammadzadeh, M. (2010). The Study of Profitability of Drugstores in Iran’s Pharmaceutical System. Iranian Journal of Pharmaceutical Sciences, 6(3), 209-216. Mehdi Mohammadzadeh. "The Study of Profitability of Drugstores in Iran’s Pharmaceutical System". 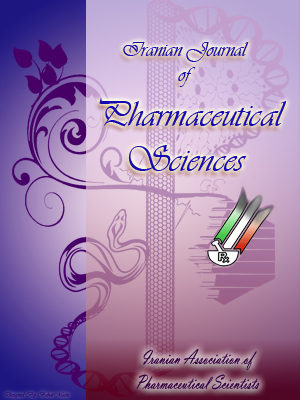 Iranian Journal of Pharmaceutical Sciences, 6, 3, 2010, 209-216. Mohammadzadeh, M. (2010). 'The Study of Profitability of Drugstores in Iran’s Pharmaceutical System', Iranian Journal of Pharmaceutical Sciences, 6(3), pp. 209-216. Mohammadzadeh, M. The Study of Profitability of Drugstores in Iran’s Pharmaceutical System. Iranian Journal of Pharmaceutical Sciences, 2010; 6(3): 209-216. Equality and accessibility of patients to medicine is an important factor of justice in health and undoubtedly, pharmacies are one of the most important elements in this regard. Pharmacies are business units to provide patients required needs according to society's medical and health basis and protocols. Presentable services on pharmacies are specific and defined, and the existing products have special characteristics and defined prices, hence pharmacies are able to carry out the business only within the standards in the country's medical system . Customers of these units are patients and contacting these kinds of clients requires specific behaviors, therefore, pharmacies are different from other small business units. This means that firstly customers are not the ones who select the product. It is primarily the physician who prescribes the products or it is selected based on the pharmacist’s advice. Secondly, the main part of the price of the products is usually covered by insurance companies or pension funds and government subsidizes in order to adjust affordability of patients and to let the low income patients to receive what they need. Thirdly, the current commercial activities in the retailing like sales, trade discounts, trade -in allowance, or selling expired medicine is illegal and pharmacies are responsible for selling medicines under standard maintaining circumstances within specific period . These small business units, therefore, must have economic feasibility and reasonable profitability. Calculating the profitability of pharmacies is rarely studied and reported scientifically. Most of the ideas are based on theoretical judgments and personal observations. In generic pharmaceutical systems, due to the fact that pharmaceutical marketing is performed mainly on push mechanism, pharmaceutical companies tend to sell more medicines using special tactics and connections with pharmacies by persuading them to put their products in patient’s medicinal basket. The tactics which are common include giving discount, free samples, cash awards and gifts and prizes . So far, in Iran, no survey has been conducted about the effects of these actions on the quality of presentable pharmaceutical services. In the generic pharmaceutical system of Iran, companies apply the similar strategies. Applying these strategies over the past few years has extensively and tremendously soared leading the formation of a false belief that greater part of profits of selling medicine is allocated to the drugstores. Therefore, pharmaceutical companies in this competitive area abandon considerable portion of their profits in order to sell more . This subject has been brought up in official gatherings to great extend so that many managers and decision makers in health system have come to this belief and expressed their ideas in media and press and this has caused a lot of conflicts between pharmacies and pharmaceutical industries knowing the fact that these conflicts about profits can damage country’s health system seriously . In this study, it has been tried to examine whether Iran’s pharmacies in case of merely selling medicines, are profitable or not and provide solutions with analyzing the results about involved agents in pharmaceutical supply chain and efficiency of pharmaceutical services. 1- Seeing that pharmacy products do not comprise significant prices, and many clients refer to pharmacies every day. 2- According to the fact that prices are fixed in pharmacies, negotiation on prices or bargaining is impossible and patients are supposed to pay the exact mentioned price. 3- Choosing products is normally not on the patient but on whether the physician who has prescribed the medicine or the pharmacist who might give them some advice. Therefore, because it is generally considered that pharmacies are extremely profitable, regularly the rules toughen their business and new pharmacies establishment turn to be harder. However, increasing number of pharmacies makes patients' accessibilities to the medicines easy and convenient besides, it prepares working opportunities to graduates of pharmacy faculties, but in case the pharmacies have no enough profits, there is the possibility of decline in technical services for customers or perhaps some unreasonable profitable activities might be carried out. To answer this question, there are some sub-questions that are required to be answered which can lead us to find the final answer. 1- What are the average costs of a pharmacy? 2- How much profit does sale mark up and technical responsible fee bring for a pharmacy? 3- How much is the amount of sales per capita of a pharmacy according to annual issued prescription rate and whole market volume? Limited studies have been conducted about profitability of independent pharmacies around the world. This little carried out researches show noticeable differences in terms of profitability and consumer’s behavior in Generic and Ethical systems. Independent pharmacies are able to attract customers and increase their profitability using special marketing tactics. One of these ways is applying tele-pharmacy systems. Studies have shown that using tele-pharmacy in North Dakota State brought on noticeable improvement in pharmacies operation . In a research, pharmacies output is considered based on gross and operational profit and effective factors on them in a fiscal period and has been proven that face to face marketing has significant positive effect on profitability of a pharmacy . In addition to that pharmacy’s connection with telemedicine system in rural areas in U.S not only has caused a decrease in health expenses of public and avoided people’s waste of time but has effected more referral to the pharmacies and has improved pharmacies’ profitability . While it seems that pharmacies can increase the number of their customers through attracting patients and providing value creative services, pharmacies outcome as a small business unit is not just regarded to the sales volume and number of customers but is depended upon several factors, and one of the most important ones is reimbursement period (payback time) from insurance and supportive organizations. U.S pharmacies, which work under Medicare system, have lost around 4% of their profits regarding long period of reimbursement in insurance system in 2006 . Studies that are carried out in economic field of pharmacies and their business success show that several indexes as sales amount, medicine’s profit margin, reimbursement period, technical fee of pharmacist, payment conditions to wholesalers or suppliers, inventory turnover and cash management play important roles in this regard . What is not researched thoroughly is that whether in complete generic system which sale amount of pharmacies is depended upon factors like availability, price, geographical location, fast acting and variety of products, are pharmacies able to be profitable merely by dispensing medicines? We could not find a reliable study in Iran in this regard and most of found resources are related to pharmacist’s unions like Iranian Pharmacists Association claims and assertions. Many pharmacists and Iranian Pharmacists Association, as well as the author claim that one of the reasons that prevents pharmaceutical improvement and keeps patients unsatisfied from pharmacies in this country is pharmacies’ low profitability and pharmacist’s dissatisfaction that leads to a conflict between pharmacies and pharmaceutical industry since pharmaceutical companies which are always looking for some ways to sell more and make more profit using various methods to have more portion in patients medicinal basket. The author considers the DCFP (Distribution Channel Friendly Practices) as one of the best ways to acquire more portions in shelves’ of pharmacies, specifically in generic area which choosing medicine for prescription is on pharmacists. In order to increase their profitability, pharmacies, look for fast and gigantic distribution channels with high financial ability so they can progress the products circulation and improve payments conditions . According to reviewed articles, it seems that one of the reliable methods to evaluate pharmacies’ financial operation and their profitability is study of balance sheet and income statement . In this study, they have been tried. Due to our target society and minimizing research bias, case study has been selected as the most suitable research strategy and a sample including 100 cases in 20 districts of Tehran have been defined randomly for daytime pharmacies and none randomly for 24-hour pharmacies. Therefore, in each district four daytime pharmacies and one 24-hour pharmacy have been studied and their financial operations were put into consideration. The approach of this study is descriptive-explanatory, and semi-quantitative method has been used, which information about different costs of pharmacy such as operational and overhead costs, rents, wastage, cost of expired medicines, and administrative expenses have been collected by questionnaires from the cases, then annual average expenses of a pharmacy in Tehran has been estimated. To obtain real sales amount of pharmacy from dispensing only medicines, with use of archival review and historical records and estimating total price of each existing prescriptions in Social Security Organization sent by pharmacies, they have been sampled and average price of each prescription has been determined and the profit of medicines and income through technical services fee of pharmacist according to Ministry of Health and Medical Education instruction has been estimated. Secondary data including amount of annual sale of domestic produced medicines and imported part has been collected from MoH annual report , and number of independent or hospital pharmacies, obtained from Darupakhsh distributing company . Content validity of questionnaire was confirmed by 10 expert pharmacists in an expert panel. On the way to minimize the bias, along with sending questionnaire, interview method was applied as well and more than 20 expert pharmacists were questioned in this regard. Despite of all the given efforts regarding the difficulty of accessing detailed information of pharmacies expenses, inventory turn over is not calculated. Besides according to law, insurance institutions are supposed to offer the prepayments to pharmacies one month in advance. We assumed that this law has been conformed and period of advance payment is the same as reimbursement period and no loss for reimbursement rate is on pharmacies. In order to provide the possibility of face to face interview, the study has been conducted in Tehran province (different districts of Tehran, Karaj and Varamin). With studying and comparing profits and expenses of pharmacy, we realize that with merely selling drugs not only pharmacies are not profitable but also they will have losses. The results show that if pharmacies in Iran with defined margins and sheer volume of medicine consumption sell medicines only and avoid other sorts of pharmaceutical businesses they will have losses. A pharmacy’s loss as an important unit in pharmaceutical and health services supply chain can cause serious damages to the quality of health services and ultimately society’s health level and quality of life. Since limited level of pharmaceutical consumption in each country can be a sign of social development, improved life style and welfare, existing of low profitable pharmacies or even disadvantageous ones are serious dangers in this regard and is important barrier to achieving these goals. As a result, cheap medicines or low price and sale margin more than hurting pharmacies and pharmacists, might hurt society’s health by persuading induced demand. Therefore, in a condition that merely selling medicine brings on no profits for these small business units or even can impose some losses, the improvements of this condition is unlikely in a short time, hence the best way to support pharmacies includes some new policies like giving some special commercial credits and privileges or covering some legal expenses by government that decision makers must consider them thoroughly. 1. Some items such as hygienic (skin cares), cosmetics, medical devices and food supplements should exclusively be sold in pharmacies and be prohibited to be sold in other commercial areas. 2. Some parts of tariffs or legal commitments like insurance or taxes should be forgiven by government and this credit should be variable according to pharmacy’s effort to rationalize drug consumption in society and persuade patients and pharmacists to apply high quality domestic produced medicines instead of imported ones. 3. Reasonable profitability of all the elements in pharmaceutical supply chain from supplier to dispenser must put into decision makers consideration so that the business units will not be forced to amplify quantitative selling to make profit, because it can increase drug consumption chaos and abuse in society. The author tends to appreciate sincere cooperation of friends and colleagues who helped this to be done, especially Eng Ms. Fariba Ghaderi the director of Strategic Research Center of TPICO and Dr. Sogol Siah Makon chief expert of TPICO and Ms Somaieh Sabokro expert of Rosamed Co. It is hoped that these people’s help and all the others who give an effort in applied research sections qualify pharmaceutical system of Iran more and improve the quality of services provided to people. Iranian Food and Drug law. Approved by Iranian parliament;1955. Dogramatzis, D. Pharmaceutical marketing; A practical Guide”, Taylor and Francis, 2002, pp. 3-57. Mohammadzadeh M. Donyaie Daru Magazine. 2009; Vol 8, TPICO press. Mohammadzadeh M, Ghaderi F. Present situation of Iranian pharmaceutical companies. Donya Daru; 2007; TPICO Issuance. Khan S. Is there a successful business case for tele pharmacy? Telemedicine E-Health J 2008; 14: 235-44. Peterson CD. Dakota tele pharmacy project: restoring and retaining pharmacy in rural communities. J Pharm Technol 2004; 20: 28-39. Bynum AB. The impact of telemedicine on patients cost saving: some preliminary findings. Telemedicine E-Health J 2003; 9: 361-7. Carrol NV. Establishing the impact of medicare part D on the profitability of independent community pharmacies. J Managed Care Pharm 2008; 14: 768-79. Wertheimer AI. The conflicts between the pharmaceutical industry and pharmacists. J Pharm Mark Manag 2008; 18:11-9. Lee H. CMS oversight. J Managed Care Pharm 2008; 14: 22-4. Brucel ER. Maximizing profitability through commercially successful implementation of over-the-counter switches. J Generic Med 2008; 1: 13-20. Ministry of Health of Iran. Iran Pharmaceutical Data Book; MoH press, 2005. Darupakhsh Distribution Company. Annual Operational Report, 2005.